With the launch of WordPress 5.0 drawing near, it’s more important than ever to get ready for Gutenberg’s arrival. One plugin that aims to help you do this is Gutenberg Ramp. This enables you to selectively use the new editor on specific sections of your site, to help you get acquainted with the editor before it launches, and also test the functionality piecemeal. In this post, we’ll introduce you to the plugin and discuss the current state of Gutenberg. We’ll also show you how to use Gutenberg Ramp to get a head start. If you’re not yet familiar with Gutenberg or haven’t followed its development over the past few months, let’s start with a quick recap. Gutenberg is the current name for a new content editing interface that is going to supersede the current WordPress editor. It is currently planned to be included in WordPress 5.0, which is expected to launch within the next few months. The plugin version of Gutenberg was recently updated to version 3.1. It offers several new features, such as a tips interface for beginners. Gutenberg was also a major talking point at WordCamp Europe 2018, where the development team announced that the editor is almost feature-complete. They hope to have every feature included by version 3.3, at which point the focus will move to improving the overall experience. As you can tell, work is moving fast on Gutenberg. It won’t be long before the new editor replaces the old classic one we’re all familiar with. As such, it’s vitally important that you familiarize yourself with Gutenberg ahead of time. Doing so will let you make a smooth transition into the new era of WordPress. Fortunately, there’s a plugin to help you out. Let’s look at it now! 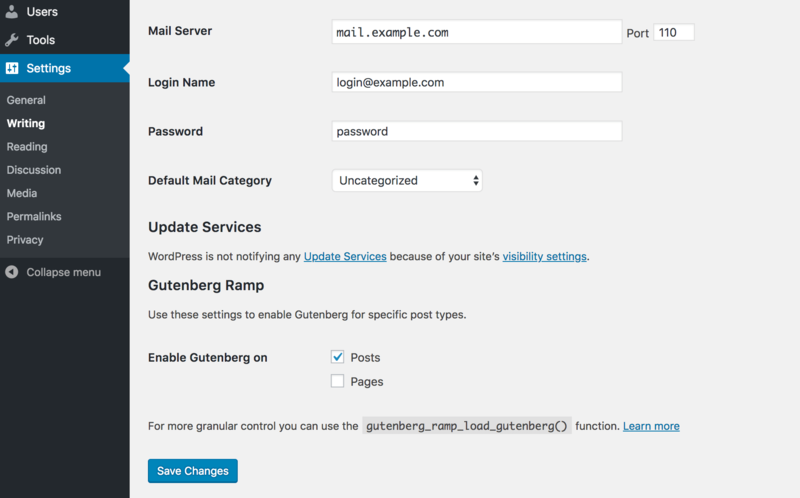 The Gutenberg Ramp plugin is a tool created by Automattic to help users gradually transition into using the Gutenberg editor. The plugin is actually very simple – it simply adds an option to let you decide when to use Gutenberg over the classic editor. This lets you specify which post types to use with Gutenberg, and also enables developers to deploy Gutenberg in even more specific circumstances. For example, theme developers can selectively load Gutenberg for certain post types or even specific post IDs. This way, you can test your theme thoroughly with Gutenberg before the editor launches properly. However, even for non-developers, the ability to use Gutenberg interchangeably with the standard editor can be a great asset. It can help you and other members of your site adjust gradually to the new editor. Otherwise, you might face a sudden, jarring shift into the unknown. Gutenberg Ramp is also completely free, with no premium plans. In order to use Gutenberg Ramp, you also need to install Gutenberg on your site. Ramp works with both the plugin version or the core version, so make sure either is installed. Note that the Gutenberg plugin doesn’t need to be active for it to work with Ramp (although this may change in the future). As you can see, this is simply a list of available post types. Selecting one lets you use Gutenberg to edit that particular post type. For example, selecting Posts lets you add or edit a post using Gutenberg. However, if you leave Pages unticked, you’ll still use the classic editor to create and edit pages. If you want to get granular, you can do that too. However, this will require a little bit of coding, so make sure you’re comfortable with doing that before proceeding. Ultimately, you’ll use a new function called gutenberg_ramp_load_gutenberg(), which is added to your functions.php file. Let’s look at some of the things you can do with this. These are only a few select examples. To find more use cases and tips on how you can use Gutenberg Ramp, we recommend you check out the official documentation. Whether you’re sticking with the standard functionality, or want to get down and dirty with code, this plugin can be hugely helpful. In short, it will give you a way to create a smooth transition into the next age of WordPress content creation! The launch of Gutenberg is creeping ever closer, and if you don’t prepare, you’ll find yourself chasing your tail once it launches. Fortunately, the Gutenberg Ramp plugin is an excellent helper for getting more familiar and comfortable with using the new editor. By selectively choosing when to use Gutenberg, you can make the transition less jarring. The advanced settings also enable you to automatically run Gutenberg in specific instances for even more control. Do you have any questions or thoughts about Gutenberg or the Gutenberg Ramp plugin? Let us know about them in the comments section below! Article thumbnail image by SkyPics Photo / shutterstock.com. The post How the Gutenberg Ramp Plugin Helps You Prepare for Gutenberg appeared first on Elegant Themes Blog.